The North regained the St George’s Cup after another spectator 37-31 victory to bring the overall series at 5-2. The St George’s Cup VIII raised over £12,000 for their chosen charities The Guide Dogs and The John Taylor Hospice. The enormous amount raised will see a guide dog puppy be named and met by the St George’s Cup Committee. Money raised for The John Taylor hospice will enable an inpatient to be looked after for 11 days. North Captain Bronagh Toleman made it back-to-back St George’s Cup titles. Last years North wooden spoon winner Lee Webb turned the tables to remain unbeaten over the weekend to take the Darren Beardsmore award (MVP). The Barry Brindley award (North Wooden Spoon) went to Ben Stanway. On day one the running total raised edged close to fives figures before the start of play. The South kicked off the first session with a narrow 5-3 lead in the opening session of the pairs. With a notable win for MVP Webb and Malcom Follis (throw away pair) over Paul Seaman and Jake Atrill, for the North to stay in touch early on in the contest. The North then found their voices and form, as they swept the session 6-2. Toleman’s blue army got crucial wins from Ellen Lunn & Matty Worden, Tony Colclough & Gareth Stanway over Alistair McCrea, James Bucknall, Gareth Davies and Chris Coates respectively. Young Northern duo Liam Lowery and Callum Mitchell came from behind to take a narrow 21-20 victory over Tom Clough and Ollie Hipkiss, to take the lead 9-7. In the rinks, the South were under the cosh early on as the North momentum continued. A late surge from the South across the board managed to overturn the situation to edge the session 6-4. Day one concluded with the scores all square at 13-13, as the captains named their singles with some mouthwatering ties for day two. Before start of play the total was at £11,000 and the competition poised for an epic finale. Both Captains made minor tweaks to their sides for the fours and was a role reversal of day one. The South started well but the North wrestled for an advantage and took both bonus points for a 6-4 session win, for a two point lead going into the singles at 19-17. The North had a dream start taking the first five points in the singles. Chris Willies came from the jaws of defeat to beat South Captain Mitchell Young for an early momentum swing as Mitchell (Callum) took the North a step closer with a 21-20 win over Jason Mclean. The South stopped the rot but could not gain enough ground the heap pressure on the North. Key victories for Alan Jones over Anthony Fautley, Nathan Cairnes over Simon Willies and Lawrence Moffat over Seaman saw the North on 31 points; four off victory. The South then threw the kitchen sink at the North to notch six wins on the board to bring the scores at 31-28. Toleman’s side then found their second wind and cranked the noise levels up a notch. Victories for Lowery, Ivan Lunn and Stanway (Senior) put the North one point away from the trophy. The North clinched victory from none other than John Lax who beat debutant Karl Hudson 21-12, to erupt with joy as celebrations started with five matches left to finish. The North regained the trophy and brought the overall series to 5-2 for the South with a grand finish to match the superb fundraising done by all players and supporters. The South MVP who also remained unbeaten for the weekend was Gary Best who was awarded the Craig Burgess award. With the Richard Walker award (South Wooden Spoon) going to Chris Coates. The new Steve White Outstanding Achievement award was set up by the SGC committee. This was awarded to Chris and Becky Willies for all their dedication and hard work behind the scenes for the SGC cause. Both captains now pass the baton onto the next. Those nominated by each team was Nick Tideswell for the North and Karl Hudson for the South for the ninth instalment of the competition next year. This entry was posted in Short Mat Bowls, Sport and tagged England Short Mat Bowls, English Short Mat Bowls Association, short mat bowls, St George's Cup. The South were victorious in the sixth instalment of the St George’s Cup and remain unbeaten to lead the series 6-0 with a 43-25 win, as the North hosted at Solihull Indoor Bowls Club. The North and South of England put their rivalries to one side, as they raised an amazing £7,550 for Great Ormand Street Hospital. The North’s most valuable player for the weekend was Danny Landon who remained unbeaten for the weekend along with Dom Reed for the South. On day one, in the opening pairs session the South took an early 6-2 lead with bragging rights for the South Captain Anthony Fautley partnered with Gareth Davies as he won 21-6 over the North Captain John Manley paired with Martyn Simcock. An Impressive 21-14 victory also went to debutant Callum ‘Gaggle’ Goodman paired with Melvin Woods, as they played their part in the first session advantage against Josh Towey and Glyn Berrisford. Mike Ivings and James Smith snatched the race to 21 as they won 21-19 to beat Keith Lacksford and Adam Smith on his debut for the North. The North’s victories came from pairings John Lax and Alan Jones in a 21-20 nail biter, along with former South player Jack Shepard and Kevin Siddle to win 21-16. The South then mirrored the first session with another 6-2 victory win, with standout victories for Bronaugh Toleman and Steve Stanton coming from 12-1 down to win 21-19. North Victories went to Cheshire duo Keith Smith and Ste Tinsley, as they won 21-19 in another tight match against Steve Killington and last year’s Captain Mark White. The other win for the North went to northern MVP Langdon and Allan Williams, as the South went into the break with a 12-4 advantage. In the afternoon, the North came back at the southerners in the third session in the fours as they won three of the four games and the newly introduced extra point – for the overall shot difference to bring it back to 13-8. Huge wins for the northern quartet Towey, Lacksford, Langdon and Smith with a 20-8 victory over Toleman’s rink and Lax, Simcock, Lowery and Manley despatched the southern four 28-7. In the final session of day one, the South upped their game to retrieve the dropped points and take the session victory 4-1 and restore the eight-point lead for 17-9 at the end of day one. Brindley (Junior), Pegg, Willies (Senior) and Follis (Junior) was the only win for the North against AJ Brown’s rink as South victories were headed by Fautley, Reed (Junior) and Smith. On day two, the North went in search of building some momentum for themselves, as they won three of the first four games in the fours and the extra point for a 4-1 victory on the first four games. Due to the South Captain losing the sponsorship challenge of raising the most money, Faultey’s forfeit was a sorrow one after his 20-14 defeat cost him 20 shots of alcohol. In the other fours, the South regained the deficit to win all four fours’ and the overall point to win the session 6-4 and extend their total to ten points at 23-13 – going into the singles. The North’s comeback hopes were dwindling, as they won just three of the first eight singles through Follis (Junior), Captain Manley leading by example and a first singles win in the St George’s Cup for Micheal Tandy as he beat Toleman (Mrs) 21-6. The South needed six points to retain the Cup, but the North were not bowing down as the next eight were split four each. Shepard edged out the wobbly South Captain Fautley 21-19, after his forfeit in the fours found himself dazed. Simon ‘Pieman’ Pridham was the man to get the South over the line and claim the victory, as he won 21-11 against Easthope. The southerners took confidence from the overall win and took the third set of singles 6-2. The South claimed five of the final eight singles matches with North wins for Berrisford, Wiggins (3rd Best) and Willies (Senior). To complete the 43-25 victory for the South with a record breaking amount raised in the St George’s Cup, for the brilliant charity GOSH. A big thanks goes out to all the players, supporters, the SGC committee and all those behind the scenes for their sponsorship support, fantasy bowls, raffle and bonus ball which contributed to the cause – surpassing all expectations, long may it continue. For more information on the weekends scores, teams, players or about the St George’s Cup in general then check out the SGC website http://www.stgeorgescup.co.uk/index.html. This entry was posted in Short Mat Bowls, Sport and tagged GOSH, Great Ormand Street Hospital, short mat bowls, St George's Cup. Well, it has in the sport of bowls (yes, it is a sport, before you start) in the variation that is short mat bowls. Short mat bowls, for those of you that have not been blessed to play the game, is similar to curling, where the aim is to get your bowl (not one you eat out of) as close to the jack (a small yellow/white ball) as possible. The game is played on a carpet of six foot wide and 42 to 45 foot long, with a block of 12 inches in the middle which you have to navigate around. You think that is easy? I beg to differ. The player or team with the most points over the designated amount of ‘ends’ wins the game. The St George’s Cup idea is an English variation of the Ryder Cup with the contest involving ‘the North’ of England versus ‘the South’ of England. The boundaries on which side you qualify are still not set in stone (unless you are on the brink of Scotland or you are in Cornwall). A selected captain for each side picks their top 32 players from their half of the country. All proceeds raised from the event go to charity in aid of Great Ormond Street Hospital. I personally cannot wait for the event to begin with both sides set to lock horns and ultimately take the title and prove who is best for another year. Needless to say bragging rights are also at stake. The rivalry tops that of Europe vs USA every day of the week. ‘The South’ are replicating Europe at the moment, dominating, and it is a trend I do not see changing any time soon. I have been fortunate enough to take part in this popular event since it began, and this year I will be part of the fifth instalment. The event was founded five years ago by two northerners, Nick Tideswell and Darren Beardsmore. The idea caught the attention of southerner Craig Burgess, who helped Tideswell and Beardsmore take the idea to another level, and it has now become a prestigious event in the short mat bowls season. With the idea brought to life in 2010/11, the first captains were Burgess and Beardsmore, with the South winning 35-12. “I was very proud to be part of this event which raises money for such a worthy cause. Winning the first ever event as captain was special,” said Burgess. Last year’s battle was worthy of full Sky Sports coverage as it went down to the final singles match to conclude the whole weekend. It ended in a dramatic draw at 32-32 (this can be seen on YouTube), and as per Ryder Cup rules ‘the South’ breathed a sigh of relief and retained the title, despite ‘the North’ claiming a draw. The captains for this year’s event are Mark White for ‘the South’ from Dorset and for ‘the North’ a joint duo of Allan Williams and Chris Williams from Shropshire, chosen by the St George’s Cup committee. “Looking at this season’s event it is going to be interesting to see what happens, with the last event ending as a tie I am sure we are in for another close weekend,” said fence-sitter Burgess. “To be the North captain is an honour, but does prove somewhat difficult with selection…actually the hardest part of the selection is to actually get 32 players,” said Allan Williams. “Being a South Captain for this year’s event is something I hadn’t considered doing before. And it feels like a bit of an honour to manage the abundance of quality players we have in the South team,” added White. ‘The South’ team announced recently is strong as it always is and I feel the side has enough to withstand ‘the North’, whatever they throw at us. “The squad will not look too much different from last year due to the relatively small pool of players to choose from, ” said Allan Williams. He suggested that allowing ‘the North’ to choose from a wider amount of counties would help with the range of selection, which could make the event even more competitive. “The event itself I think will be as good if not better, than previous years. The rivalry and friendly banter makes the event for me. With last year’s match ending as a tie, I think that will spice things up as the North will be confident they can pull off an upset and the South (I hope) will be out to prove last year’s result was not a fluke!” added White. 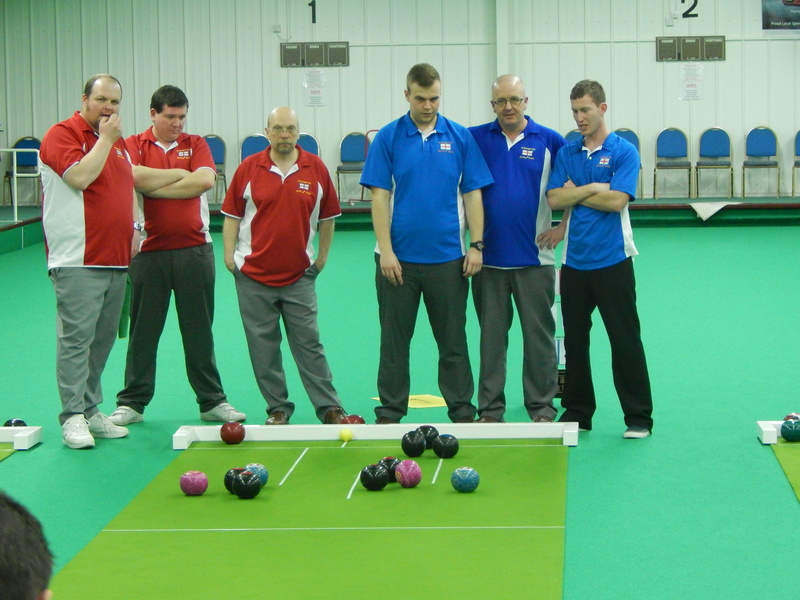 ‘The North’ and ‘the South’ are set to go head to head on 14th and 15th March at Bromsgrove Indoor Bowls Club. This entry was posted in Short Mat Bowls, Sport and tagged bowls, short mat bowls, St George's Cup.